There was and is always a lot of talk about the various feuds between Remy and Ernesto through the years. How friendly were they? Could they work together? We have covered some of these stories on the Facebook Presas Tribute page, But, I can write about what I think was one of their last interactions. A final phone call? Then…then…disturbing…he suddenly picked up with a Dallas area woman that was, frankly…a mere shadow of a woman compared to Yvette. WHAT? We all asked ourselves. HER!? Really? And he wound up living at her house very near to where I lived. Near the DFW airport. We all felt sad for Yvette and the kids up in Vancouver. I had Remy’s new phone number with this Dallas girl, and while it was nice to have him nearby, but jeez you know? Yvette! He wanted to talk to him. Hmmm, this is tricky for me to be in the middle of this. But, I got the number out and dialed it. I got Remy on the phone. Ernesto stood looking out the balcony. Nervous. Waiting. Whew! I handed Ernesto the phone and he sat at my kitchen table and they talked. I tried to make myself busy around the apartment. From what I could hear from Ernesto’s part, it was going very, VERY well. I was feeling good about this. This call lasted about 20 to 25 minutes, during which Ernesto told Remy that he was his brother and he loved him. The phone call started winding down. It was going so, so well! Crap. I knew instantly that was not good. This was not what Remy wanted to hear. And from Ernesto’s face, I knew that asking that question was a mistake. Remy immediately got mad. It almost seemed like that request was the real secret reason for wanting to talk with him. Which it wasn’t. I guess the conversation was going so well, Ernesto just asked. The decades old, sort of rivalry they had reared up again. The whole, younger brother vs older brother thing, doing the same business thing. Ernesto hung up after that request and shook his head. I don’t know what Remy said but it was not good. Yeah. You have to think that Remy spent his whole life slowly developing contacts and having seminars and working, working, working to establish this…list. The hard way. The “original” way. A path-blazing way. Very few people were doing seminars back then. He and just a few others kind of “invented” the path. And to…to give it away or give a portion away, is very difficult. 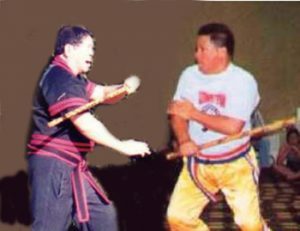 Many of us use to think how cool it would have been to have at least one big, Presas Brothers weekend seminar. If I were involved, I could have organized it in Kansas City, center of the country for all to get to. But it would and could never happen. I do believe if Ernesto had not asked that final question, while things would have been so friendly and so fine, and a good memory of what I think was maybe their last conversation (?) Remy still would NOT actively help him or do something with him like a seminar. In the end I don’t think that Ernesto needed the help anyway. He was doing fine. What would a Remy and Ernesto seminar be like? Look like? Would Ernesto people like to delve so deeply into Tapi-Tapi? Would Remy people like to get back into longer-range, head-banging? Would something happen, or be said and the two would stop talking? It’s just a….a macho brother-thing of two macho brothers trying to do the macho “seminar” thing. Previous PostBinge and Purge – The Martial Arts – Or, How I Learned…Next PostCalm Down About Calming Down!